I am still an old-fashioned, paper-calendar kind-of-girl. I've tried to keep my schedule online but I find it very cumbersome. Somehow, I always end up scheduling things IN THE WRONG YEAR. I'm not kidding. I try to book something for November 15, 2012 and it ends up on November 15, 2013. Which is not at all helpful come either one of those days. Plus, some things are just easier and faster to simply write down. I was out to lunch with friends the other day and the waitress whipped out an iPhone-looking thing and started to tap our order into it. It. Took. For. Ever. I was all, really...you can't write this down and then go away and tap it into your little system? I've only got an hour with these ladies and 10 minutes of it have now been wasted on you sliding your finger across that stupid pad while making huffing sounds. There's a reason why pens and paper continue to exist in this digital world. 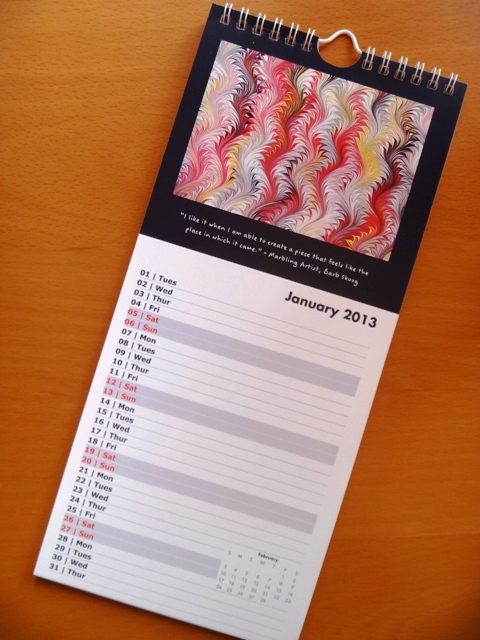 So I am once again printing a 12-month calendar with my favorite marbled images I created this past year. In addition, each image will be accompanied by a quote ~ or, to put it another way, marbled musings by yours truly. The month-by-month planning calendar is a compact size (5" x 11.5") and is great for kitchens, work spaces, and even for toting around in your purse (which I do all the time). It is spiral bound which makes it easy to lay flat on a desk or hang on a wall. It is an exceptional value at just $13 including shipping or personal delivery by me! If you're interested in purchasing one, please send me an email at Cheers "at" BarbSkoog "dot" com by November 16. I will ship them around December 10. Below are the images included in the 2013 calendar (the images will not have my website address plastered all over them). 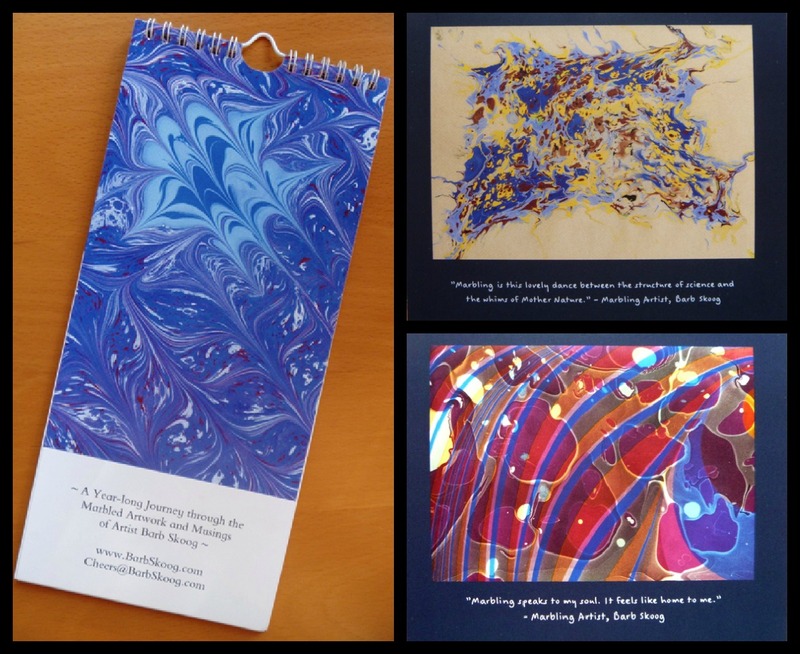 You'll have to buy the calendar to see my marbled musings!